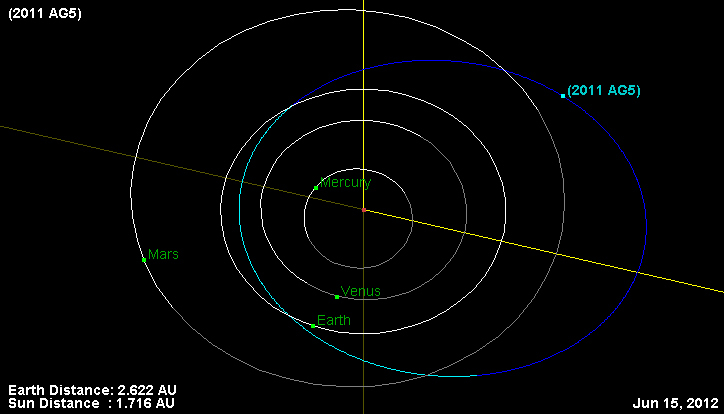 Orbit and current location (6/15/2012) of asteroid 2011 AG5 (Credits: NASA/JPL-Caltech). Asteroid 2011 AG5 was discovered in January 2011 and was considered to be at risk for collision with Earth in 2040. Scientists now consider that eventuality to be unlikely to occur. “While there is general consensus there is only a very small chance that we could be dealing with a real impact scenario for this object, we will still be watchful and ready to take further action if additional observations indicate it is warranted,” said Lindley Johnson, program executive for NASA’s Near-Earth Object (NEO) Observation Program. The finding was published in a report just issued from a workshop held at NASA’s Goddard Spaceflight Center at the end of May. The workshop focused on PHA – potentially hazardous asteroids – including 2011 AG5 and other asteroids such as Apophis, which captured global attention in 2009 when scientists published a 2% probability of it colliding with Earth. In the case of 2011 AG5, scientists are not yet willing to say that Earth is completely out of the woods. Based on current assessments, which have been built from a limited knowledge of the asteroid’s trajectory due to restricted viewing opportunities, there is a 1 in 500 chance of 2011 AG5 impacting Earth. However, it is currently impossible to view 2011 AG due to its proximity to the Sun. Further details should emerge over the next few years. Trajectory of Asteroid 2011 AG5 as currently known (Credits: JPL/CalTech). The goal of future observations will be to determine whether the asteroid will pass through a small region of space, known as a keyhole, in 2023 that would put the asteroid into resonance with Earth. Scientists do not think this likely to occur, but if it did, the likelihood of 2011 AG5 delivering a 100 megaton impact on February 5, 2040 could rise to as much as 15%. 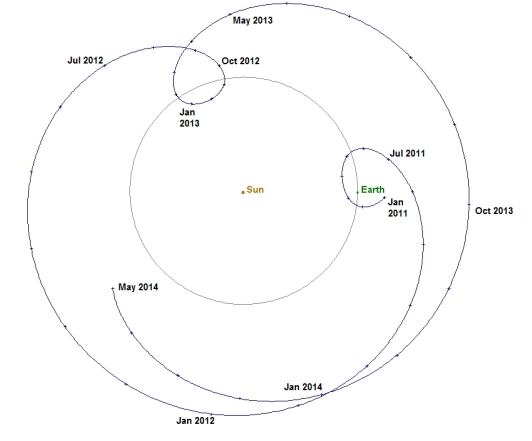 The next best viewing opportunity for the asteroid will take place in September 2013. However, with some additional efforts, it would be possible to capture a brief view of 2011 AG5 via the Hubble space telescope. The lack of reference stars in that field of view would require some extra preparatory work involving the Keck Observatory that may not be authorized due to the lack of scientific value to be gleaned from the observation. Afterall, why waste time saving the world when there is science to be done?